This unit combines a gently compensated volume control with switchable low bass and high treble boosts, useful for lower-than-live SPL, bass deficient recordings, and HF hearing loss. Let me begin with the results. Figure 1 shows the two switchable (plus combined) bass boosts and a mild top octave boost. Figure 2 shows the volume control pot’s switchable (and gentle) loudness compensation. FIGURE 2: Loudness compensation responses—attenuator setting = 0 to -25dB in 5dB steps. 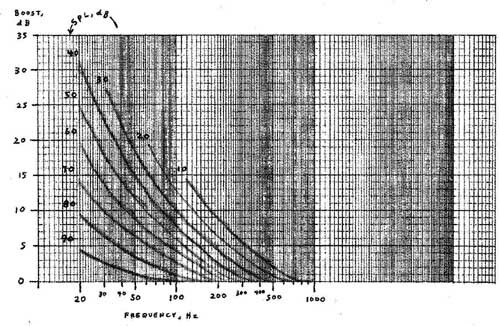 Figure 3 is the familiar family of equal-loudness contours pioneered by Fletcher/Munson, and refined by Robinson/Dadson. 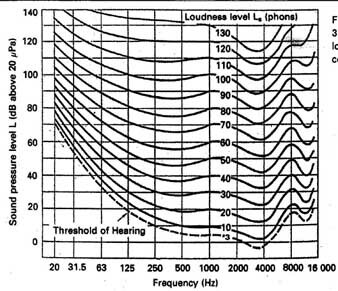 While many loudness compensation circuits use HF boost, note that there’s very little hearing response change above 1kHz, from 10 - 130dB SPL, in Fig. 3. In Fig. 4, I plotted the LF boosts needed to restore hearing response to that heard at 100dB SPL, for listening levels of 10-90dB (the nine curves). I chose 100dB as the flat-hearing reference because there’s very little change above that. Note: The playback SPLs used here for compensation refer to the loudest (full scale) recorded levels (normal dynamic variations don need compensation). The circuit’s full combination of “LF1” and “LF2” (Fig. 1) and the volume control compensation of Fig. 2 (below -20dB re full volume) pro vides 17dB boost at 40Hz, which in Fig. 4 is what’s needed at 42dB SPL. Thus restored 40Hz perception can be maintained down to a quiet “back ground music” level. 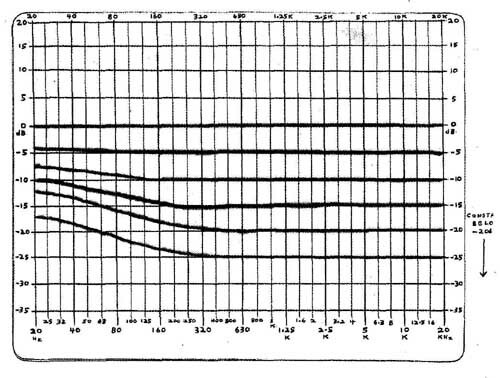 For pipe organ fans, the maximum 20Hz circuit boost is 23.5dB, enough for compensation to 53dB SPL. FIGURE 4: Equal-loudness compensation boost required vs. frequency, relative to 100dB SPL and 1kHz. From Robinson-Dadson, 1956; mod from Fletcher-Munson, 1933. The mild HF boost (2dB at 10kHz, 4dB at 20kHz) is useful to non-intrusively compensate slightly dull recordings, speaker rolloff, and/or hearing loss. The HF boost sounds natural with good vinyl or SACD music, but I don’t like it with most CDs, because it can emphasize the graininess of the PCM process with an insufficient 16 bits. The volume control (P1) has a 10% tap, which provides the Fig. 2 loudness compensation from R1, R2, C1 when selected by S1. Minimum input Z is 27k-ohm. If this is too low—say, for a tube preamp output—the input can be preceded by a voltage follower op amp with an input terminating resistor of your choice. This op amp can also provide gain if desired. U1 provides the “LF2” boost. When S3 shorts C2, U2 has a flat gain of 3.01 (9.6dB). C6 provides an infra sonic rolloff at 4Hz. With S2 and S4 in their “off” positions, the voltage divider R7, R8 has a flat loss of 9.6dB, resulting in unity overall gain, voltage followed by U2. The “LF1” boost is switched on by S2, the “HF” boost by S4. You can use any unity-gain stable op amps of your choice, but I recommend the OPA-627 shown for low noise. As shown (Fig. 5), the maximum output noise (which is with P1 at 50% R) is about 4.0uV RMS, 20Hz - 20kHz, 3.0 “A” weighted (-110dBV), with the HF boost off. With it on, the noise is about 4.9 RMS, 3.7uV “A” weighted (-109dBV). I don’t have a photo of the unit because the circuitry I built is in two separate and non-photogenic boxes. 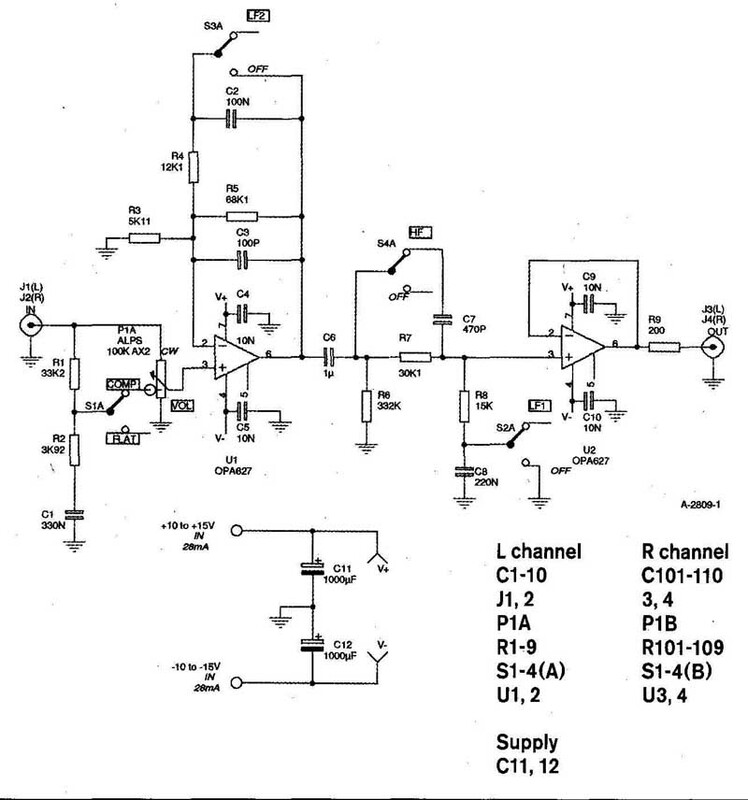 Be cause of the low gain and easy loading of the op amps, even the TL082 sounds transparent. Table 1 shows various combinations of volume setting (with S1 in the “comp” position) and the LF boosts. One important note: The SPL shown is for the loudest parts of a recording. Obviously, when the music becomes quieter, extra LF compensation isn’t required in a live setting. The compensation is needed when the playback level is lower than the live level. However, there’s a nonlinear effect here, because required compensation isn’t directly proportional to the change in SPL. This is reflected in the non uniform curve spacings in Figs. 3 and 4. But this doesn’t seriously affect the overall restoration of LF hearing sensitivity. Notice that with the system set for 100dB SPL at full volume (P1), the volume dependent compensation selected by Si provides enough boost without LF1 and LF2. The latter can provide the extra boost needed when full P1 volume produces less than 100dB SPL (or whatever the maximum live SPL was). For reference, a large orchestra playing its loudest produces an SPL in the neighborhood of about 105dB. FIGURE 5: Schematic, loudness compensation volume stage. The SPL figures referred to in this article are the waveform-averaged values, corresponding to average power and RMS voltage. These SPL levels do not represent instantaneous waveform peaks, which are typically 10-20dB higher for live acoustic music. My article, “ Musical Waveform Peak and Average Power Frequency Distributions”, explores this. As I mentioned, the bass and HF boosts are there for many purposes (compensation of low SPL, bass-rolled off recordings, speaker rolloff, HF hearing loss). But their usage doesn’t need a “justification”—if you like it, use it. I think you’ll find, as I do, that these boosts are effective enough when needed or desired, and much more natural sounding than most tone controls and loudness compensators. The purpose of music is to stimulate the emotions and senses. Whatever helps you achieve that from music is good.